A scissor lift is a valuable piece of equipment for many industries. Its ability to lift humans and large, heavy objects makes moving them from low to high easy. Before renting a scissor lift, it’s important to know which type you need, if training or certification is needed to operate it, and how much it will cost you. A scissor lift is a type of aerial work platform. It lifts people and equipment from almost ground level to heights depending on the type of scissor lift used. Heights range from 10 to 60 feet, and can hold weights of up to 50 tons. Those with a wider platform provide better accessibility, which prevents workers from having to reposition the lift often. They only move vertically, but with the bridge, workers are able to access items around the lift easily with safety. A battery operated scissor lift is perfect for enclosed environments. It does not emit any fumes, which makes it safe and healthy for workers. These lifts are often narrow making it possible for them to move between aisles easily. Warehouse workers or electrical engineers use these types of lifts the most because they allow them to access heights in tight locations not easily and safely achieved by other scaffolds and ladders. Exterior scissor lifts powered by diesel emit strong fumes. They come in many sizes to accommodate the needs of those in the construction industry. To choose one, renters often consider price for the maximum height and platform size needed. These come with reinforced tires to make it possible for safe use on rough terrains. For use indoors or outdoors, pressurized hydraulic oil powers hydraulic scissor lifts. Size may be a consideration for those seeking a hydraulic lift for use outdoors and indoors. Those that fit inside may not provide the accessibility needed outside. Those that provide the accessibility outside may not fit inside. Many of the outdoor scissor lifts come with 4WD to ensure that the equipment is able to get through rough terrains. According to the Occupational Safety and Health Administration (OSHA), scissor lifts do not fall into the categories of aerial lift Subpart L because the platform falls outside of the wheelbase. There are no provisions that specifically address scissor lifts, but they do fall into the definition of a scaffold. Therefore, scissor lift safety should follow the 1926.451 - General Requirements for Scaffolds. Fatalities often occur due to poor training and not following safety procedures. 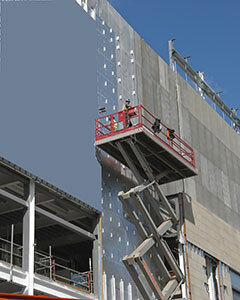 OSHA requires training, according to OSHA 29 CFR 1926 Subpart L Scaffold. Training includes learning how to operate the scissor lift and safety measures. Online courses can take as little as two hours. Most training programs issue a training card certifying completion. The rental cost of scissor lifts largely depends on size. Exterior scissor lifts and hydraulic ones are most expensive than indoor ones. People often rent scissor lifts for as long as they need them. They can be rented for as little as a day, weeks, or for months. Often times, renters can get a better deal when they rent lifts for an extended period. The average daily rental price for scissor lifts is $100 to $150 per day. Weekly rates can be from $350 to $500. Monthly rates can range from $800 to $1,500 or more depending on the size of the lift. Since scissor lifts require delivery and pickup, there is usually an added fee of about $150 for those services. Scissor lifts are an expensive purchase. They can cost $24,000 or more. Most people rent scissor lifts even if they use it daily because of the initial investment and then the additional maintenance expenses that are required. You do not have to rent scissor lifts locally. 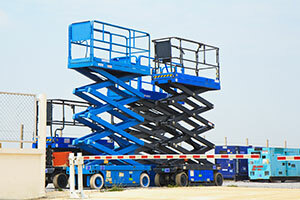 Nationwide scissor lift rental companies will be able to deliver the size you need quickly. Since there are many companies that offer scissor lift rentals, it’s important to know the average cost to rent an electric scissor lift.. This will help you make an informed decision and get the best price possible to save you money, especially if you need to rent one for a long time. Measure where you will need to use the scissor lift. Be sure to measure as high as you would ever need to go, not as high as you usually go because you want a lift that will be useful at all times. Consider purchasing a lift for indoor and outdoor use instead of just one that can go from the inside to outside. Outdoor scissor lifts often provide functionality that an indoor can’t provide, and vice versa. Always check the delivery and pickup fees to ensure they fall within your budget. These fees can become expensive if you only need to rent a scissor lift a day or a week at a time. Read reviews online of the scissor lift rental company you are considering to ensure it is reputable. Renting scissor lifts is an economical choice for most businesses. Rent one for your needs to improve productivity safely and easily.